Recap of November’s Drinking About Museums: Boston, NEMA edition! Jenn and I were both in Dallas in November at MCN 2014. Luckily, Alli Rico was ready and willing to make sure the Drinking about Museums torch was carried proudly during the New England Museums Association conference. Here’s her report. When Ed approached me about hosting the NEMA Edition of Drinking About Museums: Boston, I have to admit, I was a little nervous. Would people come? Would I totally mess it up? Luckily, going to a bar, enjoying a drink, and decompressing with friends and colleagues after a day of conference sessions is something everyone already knows how to do. #drinkingaboutmuseums Boston was scheduled for November 20th, after sessions for the NEMA Conference had broken up and folks had been given a chance to relax. When I arrived at the bar a little before 6, the party was already in full swing – and it was packed! I’m not even sure if everyone was there because they knew about DAM, but personally, I think that’s the beauty of the thing: there’s no learning curve. Show up, grab a drink, maybe some food, and chat with your friends (or make new ones!). 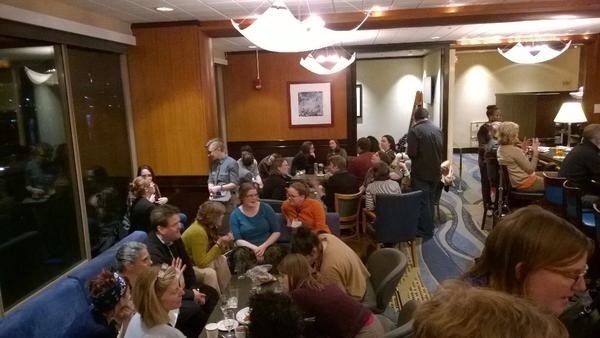 Some folks sat and got dinner, while others grabbed a drink and mingled, and it was great. I’m happy to say there was a great showing by the YEPs contingent as well! A big thanks to the hotel bar staff, who were already understaffed for the evening. It was a great evening in the middle of a great conference, and I’m glad we gave folks who weren’t going to evening events a place to hang out with colleagues and decompress from the day. Drinking About Museums: Boston is tomorrow 12/3! Hot on the heels of last months NEMA-themed DAM, we’ll be squeezing in one last event to close out 2014, and we’ll be hosting a special guest! Jen Oleniczak, the Engaging Educator herself! So brave the cold, and come on out to the Hong Kong to talk about education, improv, and more! As always, all are welcome. Tell your friends!